YT Neo - template Developed by YOOtheme. This template offers three main themes and several options for background images for each of them. You can select a gradient style, retro or business style. Ideal solution for any type of site. Of the features of the template YOO Neo can celebrate a new "glass" style module, an additional list style "hoverbox", use Google Webfonts API, included in the template parameters. 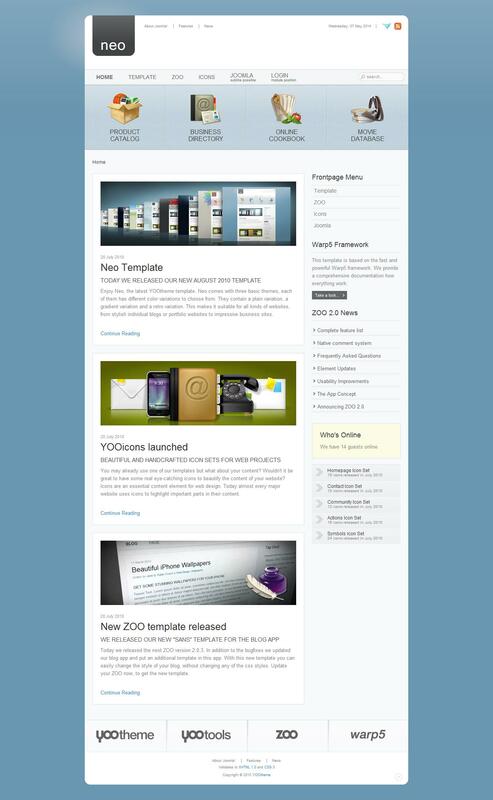 Template YT Neo universal, its pleasing design easily adapts to the subject matter of your site. Template also will be pleased with the presence of webmasters 12 stylish colors and styles variety of module positions. YT Neo is based on the framework Warp5.